My Sunflower State of Mind: Welcome Baby Girl! 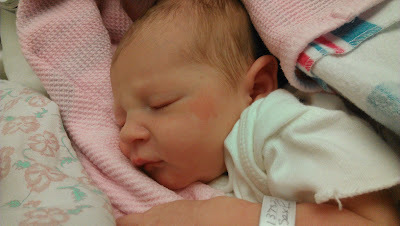 We welcomed our happy, healthy baby girl! 20 1/4in. long. She is such a beautiful baby and we couldn't be happier. We are looking forward to getting to know her and seeing what awaits us in the future. oooh, what a sweetheart! Congratulations! She is so beautiful. Having a daughter is such an adventure. Enjoy her! I'm so glad I checked to see if you had a photo here. She is so precious! I hope you are enjoying these baby days. Blessings to your family!